At Serrão Rejuvenation Center, Dr. John Serrão – a board certified gynecologist and post-graduate trained cosmetic surgeon, specializing in facial rejuvenation – and our medical aestheticians offer microneedling for women in Orlando, Winter Park, and the surrounding areas of Florida. Also known as collagen induction therapy, microneedling is one of the newest advances in cosmetic skin rejuvenation procedures. Perhaps you have heard about collagen injections to reduce signs of aging. This technique offers few, if any, real benefits to women who want to look younger, yet the concept of increasing collagen levels remains valuable. Your body produces collagen naturally, and in younger women, there is a balance between the amount of collagen that is broken down and that which is produced by the body. As we reach our 30s, our bodies produce less collagen, and this means that we develop a collagen deficiency. Microneedling uses a unique mechanism to stimulate collagen development — the body’s healing process. 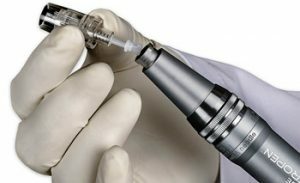 The tiny needles of the Eclipse MicroPen create micro-channels in the skin — essentially micro injuries. The channels are so small that no bleeding occurs. The body responds to the micro-injuries by stimulating collagen production to fill in the channels. At Serrão Rejuvenation Center, we are committed to providing every patient with excellent personalized service. One way that we do this is to schedule our procedures so that you receive the utmost focus and attention before, during, and after your microneedling appointment. You never feel like just another patient on the schedule that day. Dr. Serrão has an intimate knowledge of how your body cares for your skin. This level of expertise translates into amazing results from each and every microneedling treatment. Microneedling helps your body produce more collagen to reduce signs of aging and scars. At Serrão Rejuvenation Center, Dr. John Serrão, a board certified gynecologist and post-graduate trained cosmetic surgeon, specializing in facial rejuvenation – and our medical aestheticians offer microneedling for women in Orlando, Winter Park, and the surrounding areas of Florida. To learn more, contact us to schedule a consultation and begin your rejuvenation today. We use the Eclipse MicroPen for our microneedling treatments. The device has a series of very fine needles that create the micro-channels. We may complement the treatment with creams, gels, and serums that nourish the skin. The sensation of a microneedling treatment is similar to lightly pulling a fine grade emery board across your skin. How Long is the Recovery from Microneedling? Microneedling requires no downtime, but your skin may be slightly red or pink. We recommend that you stay out of the sun for the first 24 hours and use a high-quality sunscreen when you are outdoors. Pricing is based upon the recommended treatment plan from Dr. Serrão, so we can discuss the cost of your microneedling treatment during your consultation. If you are interested in monthly payments for the procedure, you can learn more about our financing options.